The Trump administration is not ruling out the possibility some federal funds will go toward the now-terminated Puerto Rico contract that caused a firestorm over both its content and award circumstances. A FEMA spokesperson on Friday reiterated Long’s assertion, but would not comment on the statement made to lawmakers and their staff behind closed doors. Long went on to say that FEMA was in the process of ensuring that PREPA has not requested any reimbursement for the costs it incurred on the contract before it cancelled the agreement. The contract sparked controversy due to the company’s connections to Interior Department Secretary Ryan Zinke and provisions restricting federal oversight, permitting work delays and setting unusually high reimbursement rates. The spokesperson said the public assistance reimbursement process begins with PREPA paying a contractor. McCaskill raised concerns regarding the FEMA official’s comments in letters she sent to Long, Whitefish and the Army Corps of Engineers. The senator said some of the $215 million already sent to PREPA in grant funding may have gone toward paying the Whitefish contract. She also said she had learned that ACE had considered contracting with the Montana company as well. 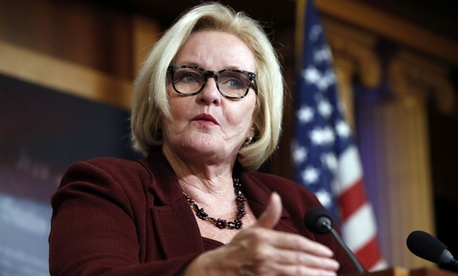 Still, McCaskill is seeking more assurances from FEMA that no federal dollars have gone or will go toward paying Whitefish. She asked a series of questions about the contracting and grant award process and for documents regarding its agreements with PREPA. She also raised concerns with a contract between PREPA and Oklahoma-based Cobra Acquisitions LLC that contained similar provisions as those that caused many—including FEMA and the Puerto Rican governor—to question the Whitefish agreement. According to Mammoth Energy Services Inc., Cobra’s parent company, FEMA was heavily involved in establishing its contract with PREPA. E&E News first reported on Cobra’s $200 million contract. During his Senate testimony, which occurred before the revelations of the Cobra contract, Long said FEMA would never go along with provisions found in the Whitefish agreement. “There’s not a lawyer inside FEMA that would ever allow that,” Long said. McCaskill also asked a series of questions about the role FEMA played in approving the Cobra contract. The House Energy and Commerce Committee has joined McCaskill in questioning Long on the Cobra contract.